"Sweet, with a kick to it." Whisk together the sugar, black pepper, onion powder, garlic salt, lemon juice, liquid smoke, paprika, hot pepper sauce, Worcestershire sauce, teriyaki sauce, and soy sauce in a large glass or ceramic bowl. Add the venison strips and toss to evenly coat. Cover the bowl with plastic wrap and marinate in the refrigerator for 24 hours. Mix the venison a few times as it marinates to ensure even absorption of the marinade. Dry the venison on High until dry but still pliable, about 4 hours. 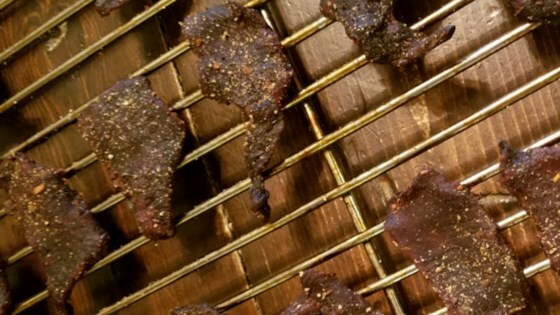 The jerky should bend without breaking. Store the jerky in an airtight container or in a resealable plastic bag. If you don't have a food dehydrator, you may also place it in a 160 degree F oven for 6 to 8 hours. this was very good, I used it for goose jerky. I left out the liquid smoke, and used the smoker. Racks were full 4 hrs at 160 degrees. I can't wait to try it on deer. This was a huge hit when I made this for my hubby and his brother. It has just the right blend of sweet and heat.